12 Days of Design: Win a Wacom Intuos Art Tablet! To help wrap up our 12 Days of Design series, we are excited to be giving away a Wacom Intuos Art Creative Pen & Touch Tablet! Each Wacom quality pen tablet comes equipped with a creative package that includes downloadable creative software, services, and online tutorials. Using Wacom’s leading pen and tablet technology, you’ll be able to hone your digital design skills and bring them to whole ‘nother level. Enter anytime before Sunday, December 20th for a chance to win. We will announce one lucky winner shortly after! 12 Days of Design: Win an Adobe CC 3-month membership! We’ve reached day 3 of our second-annual "12 Days of Design" series, and all this designing has us feeling generous! We're giving away a three-month subscription to Adobe’s Creative Cloud ($150 value) to 3 lucky designers, which gives you access to all of Adobe's creative products and services, including Adobe Illustrator and Adobe Photoshop. Enter before 9:00 AM Sunday morning (December 13th) and we’ll announce the winner just a little while later. Good luck, designers… and happy holidays! Win A Copy of SammyK’s New Coloring Book + A Roll of Custom Gift Wrap! Coloring books aren't just for kids anymore! 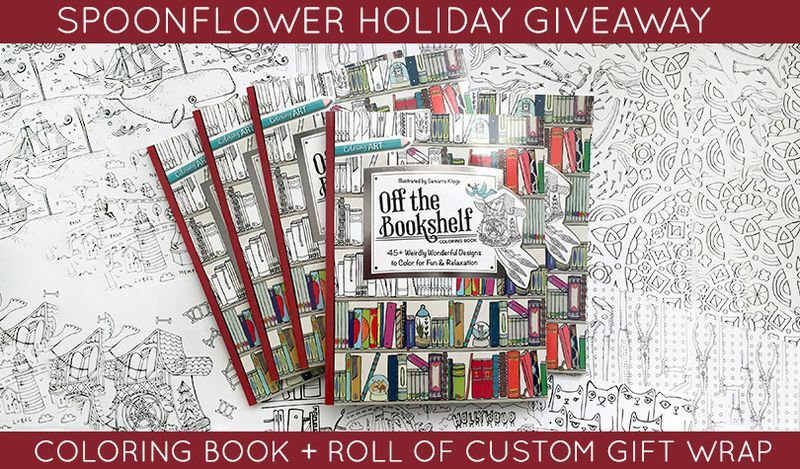 Just in time for the holidays, we're giving away a copy of Samarra Khaja's new coloring book, OFF THE BOOKSHELF COLORING BOOK 45+ Weirdly Wonderful Designs to Color for Fun & Relaxation plus a roll of Spoonflower custom gift wrap to five lucky winners! Enter by Sunday, November 29th, winner will be notified via email on Monday, November 30th. Samarra is a longtime great of Spoonflower, and we are so excited for her second book that truly speaks to the little kid in us who just wants to color, darn it. She has worked across disciplines as a designer, photographer, art director, and illustrator for the likes of The New York Times, The Guggenheim, Bliss (spa and skin care), Time magazine, Victoria’s Secret, and Cirque du Soleil—all in her signature whimsical and witty style. One of our favorite projects inspired by Samarra's new coloring book (yes, coloring books CAN inspire sewing projects, too!) is her brilliant snow globe teapot cozy! This holiday season, we love the thought of combining your favorite souvenir-worthy destinations with a warm cup of tea to reminisce over. Enter the snow globe tea cozy! Just draw up your favorite snow globe scene to fit your favorite-sized teapot, print it through Spoonflower, line it for extra warmth, sew it up and voila! Warm travel memories and warm winter beverages to warm the soul! Genius snow globe teapot cozy inspired by the "Off the Bookshelf Coloring Book." It's a special thing when a coloring book can inspire a totally fresh & unique sewing project! Samarra has dedicated a whole section of her coloring book to snow globes and we are in love. 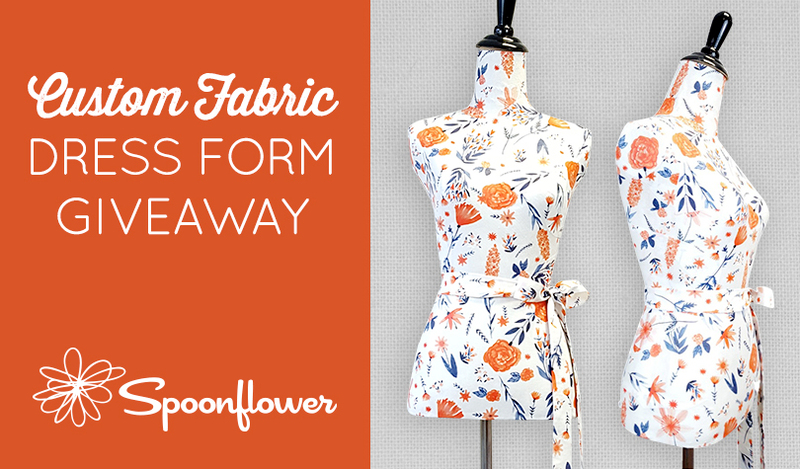 Win a Custom Fabric Covered Dress Form! We are so excited to be giving away a unique dress form created with the help of our friends at Near & Deer! The winner will choose custom-printed Spoonflower fabric, Near & Deer will expertly turn it into a beautiful fabric-covered decorative dress form. Sure to be the new star of your craft room–or any room for that matter! Enter by Sunday, November 29th at 9 AM Eastern Time, 2015. The winner will be announced Tuesday, December 1st. Be sure to increase your chance of winning by sharing this giveaway with a friend to gain an additional entry. You will see the options for sharing after filling out the entry form. Good luck! Event Planner, Professional Partier, and Owner of a New Brother Serger! Congratulations is in order for Mikii Rathmann, who says her "Irish luck must be shining through" since out of the thousands of entries we had for this giveaway, she won! Mikii says she plans on sewing baby blankets galore and a curtain for her guest bathroom with her new serger and custom Modern Jersey. She also told us that the wallpaper in the background is from Spoonflower. How awesome is that? Congrats, Mikii!! Ready to take your knit-sewing skills to the next level? Well the holidays aren’t here quite yet, but we’re already in the giving spirit. 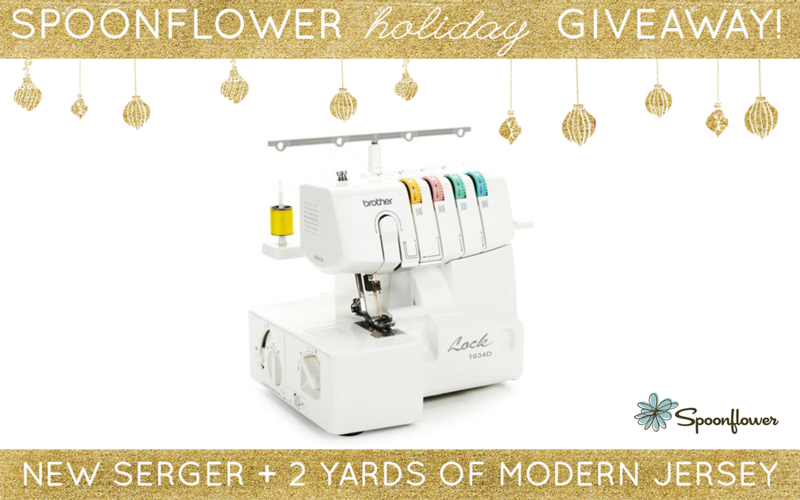 One lucky winner will take home a brand new Brother 1034D Four Thread Serger and two yards of our most popular snuggly stretch-fabric, Modern Jersey! Enter by Thursday, November 19th, 2015 for a chance to win. The winner will be notified via email on Friday, November 20th. 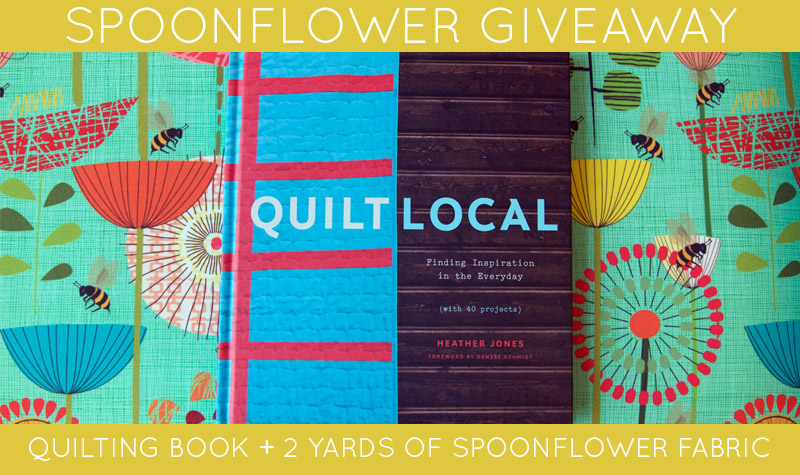 When I was contacted to participate in the blog tour for Heather Jones' new book Quilt Local I was over the moon with excitement! While I have dabbled a little in quilting, I am definitely a novice and tend to admire the skill from a far. 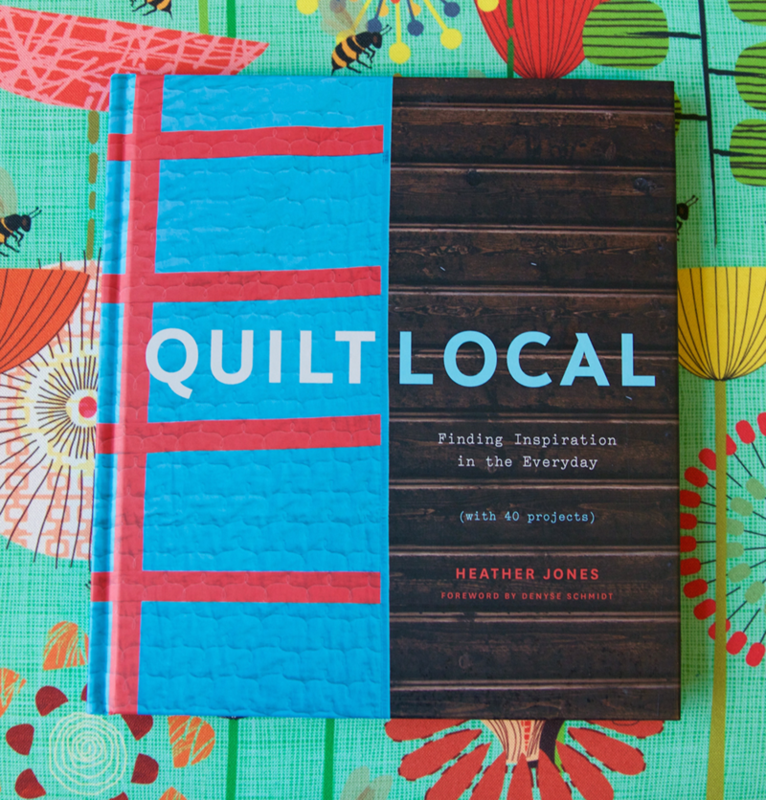 What I love about Heather's approach to quilting is her ability to find inspiration in ordinary environments and translate that inspiration to a beautiful and modern quilt. 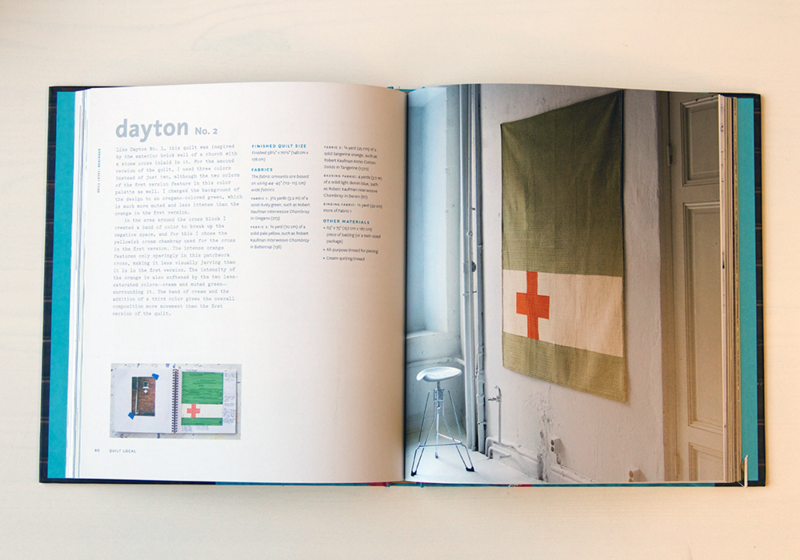 My favorite project from her new book is Dayton no.2 found on page 80. The simplicity of the quilt coupled with the bold swiss cross graphic makes for a visually appealing yet simple quilt–a homeware sure to become a staple for years to come. 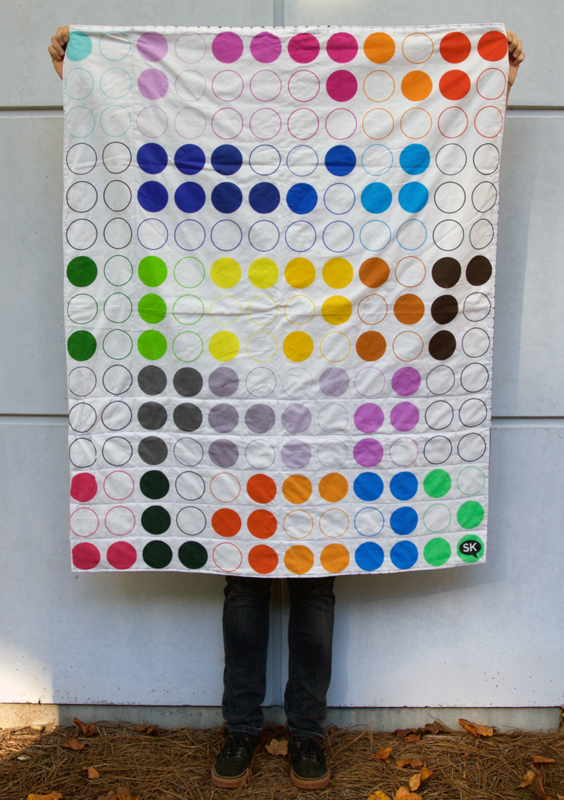 I love how she used three colors in this quilt to give it a color-blocked effect. Her inspiration picture goes to show how the most simple image can translate into something beautiful. In addition to choosing my favorite project, I was asked to snap a photo of something inspiring me in my environment to share. And I'll be honest, I stressed way more than I should in finding a pretty shot. I knew I had a trip to NYC coming up and thought what better place to find inspiration. But then found myself hours before my flight and unhappy with all my photos. 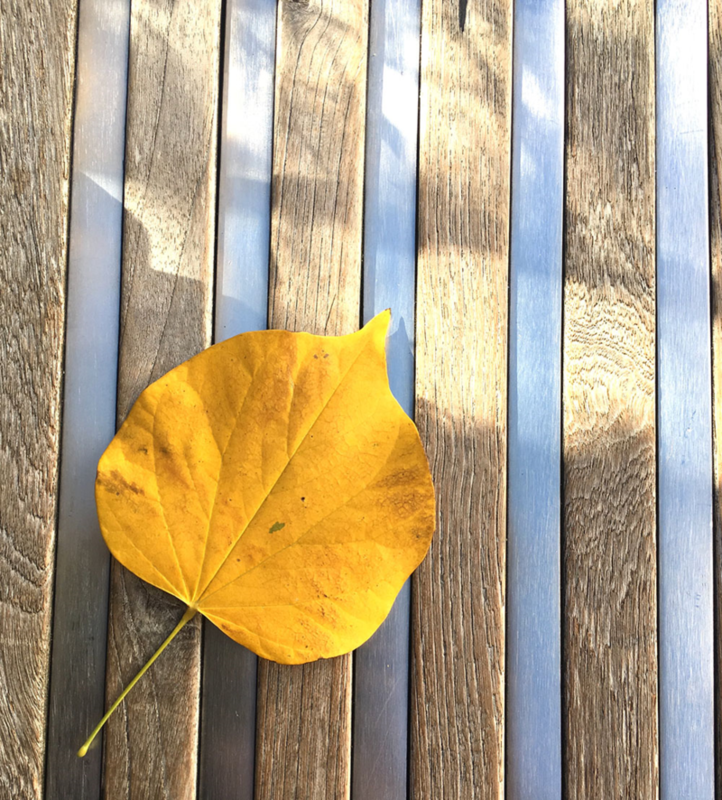 There I sat enjoying my breakfast on The High Line stressing about what I would share when I realized the geometric lines of the bench I was on, topped with the perfect yellow leaf, was the inspiration I was looking for! I love the contrast in colors and can picture a simple quilt with a colorful appliqué. Eager to get your hands on a copy? We're giving one lucky winner the chance to take home their very own copy along with two yards of Kona! Enter by Sunday, November 15th for a chance to win. The winner will be contacted via email on November 16th. Good luck! It's safe to say we're obsessed with Gertie's New Fashion Sketchbook! We love a good interactive book, and this one is by far one of the best we've seen–not to mention the gold foil cover! Flex your creative muscles and channel your inner fashion designer as you sketch your way through this amazing book! For Gertie’s New Fashion Sketchbook, Gretchen Hirsch teamed up with illustrator Sun Young Park to reinvent traditional figure templates—known as croquis—for the 21st century. Instead of the unnaturally skinny, tall, and frequently off-balance croquis the fashion industry has been sketching on for decades, this game-changing alternative presents hundreds of realistically sized and proportioned female forms in balanced, lifelike poses. In addition, Park has rendered the croquis with multiple tracing lines, allowing the sketcher to follow the lines that most accurately reflect the body shape desired. Also included are an overview of the design and sketching process and a visual history of garment component styles, all to make it easier to create fashion sketches for women of all shapes and sizes. A body-positive sketchpad to help you achieve your fashion design dreams. Loaded with more than 300 figure templates that are proportionally true to the female form and adaptable to different body types, plus helpful sketching tips and resources. A breakthrough for aspiring and experienced designers tired of the industry standard of sketching clothing on female figures that are unnaturally skinny and tall (and sometimes even off-balance). Printed in a special ink that fades away when you photocopy it. Ready to get your hands on a copy? 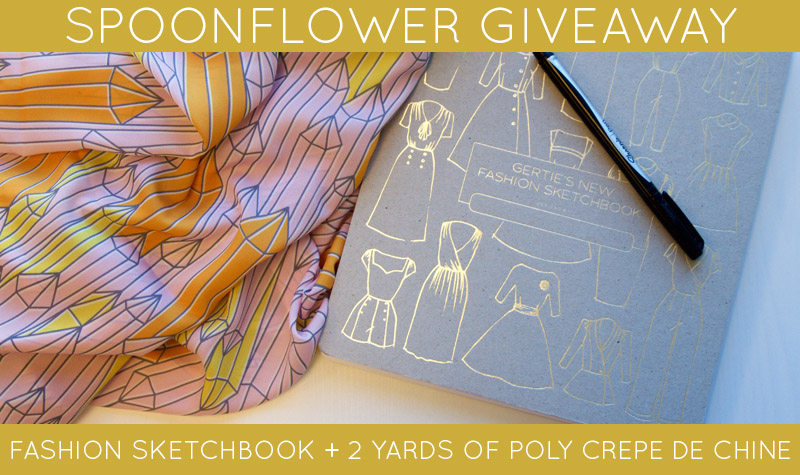 We're giving one lucky winner the chance to take home a copy along with two yards of Poly Crepe de Chine, our newest apparel fabric that is perfect for whipping up your beautifully sketched ideas. 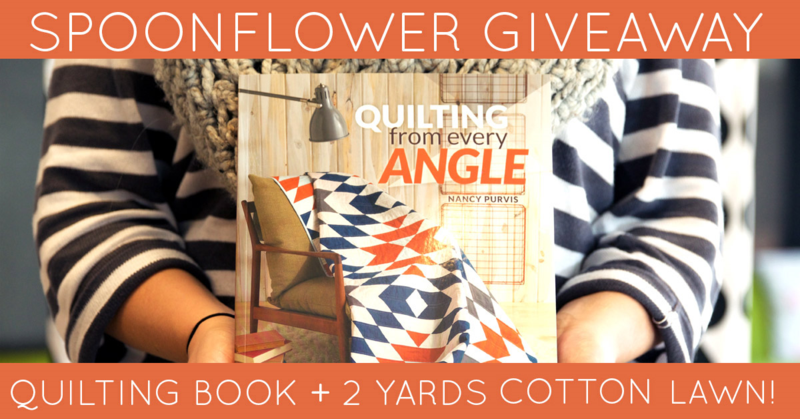 Enter by Tuesday, November 3rd, 2015 for a chance to win. The winner will be contact via email on Wednesday November 4th. Good luck! Today we are thrilled to have the opportunity to share our project + giveaway a copy of our dear friend Samarra Khaja's (you may recognize her as SammyK!) 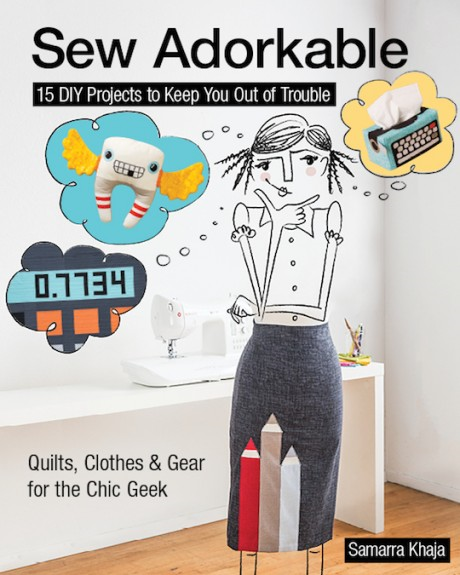 new book Sew Adorkable as a part of her blog tour! Sew 15 conversation starters, from cheeky wearables (TRAWRzers!) to quirky quilts and home decor. Make a puffy quilt that looks like candy dots, or stitch a tissue box cover that looks like a vintage typewriter. Tailored to smart, talented, crafty folks of all ages, this hilarious book is just as fun to read (trivia time!) as it is chock-full of sewing projects.